One thing I have learned and observed is that there are specific shoes that a person needs to wear based on the nature of his or her work. That being said, having the best shoes for waitressing is an utmost importance to do the job well. I used to work at a restaurant during my younger days and having the most appropriate footwear became a challenge at some point. Working at a restaurant made me realize the importance of having the correct footwear. I have encountered slips, aches, and pains before I became aware of the need to find the best restaurant shoes. Based on my personal experience, finding the best one can difficult but not impossible. This article will show my top picks for waitressing shoes. In addition to that, I will also share tips on what are the qualities of the best shoes for kitchen work. The first on the list of work shoes for women that is perfect for waitressing is the Skechers Women’s Work Soft Stride-Softie. These kitchen shoes feature a leather upper and have a full lace-up panel and a padded tongue. I find Sketchers to be a very reliable brand and this specific did not disappoint. It has a removable polyurethane insole that offers comfort for the feet. Additionally, what I like about these work shoes is that is it OSHA compliant to be slip resistant and features a rugged sole for an extra grip. With that, you don’t need to worry about the wet and oily surfaces that you might encounter during your shift. Lastly, it comes with an all-black design that surely conforms to the usual dress code of most restaurants. 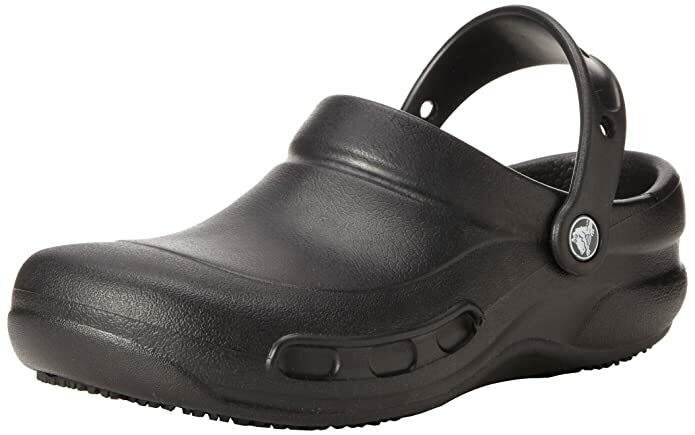 Another contender is the Crocs Unisex Bistro Work Clog. 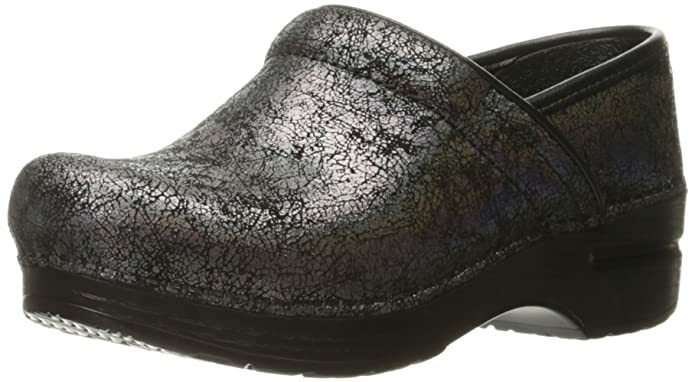 This slip on work shoes is made from synthetic material. In my personal opinion, what makes it great is because it is made through Croslite material construction. This makes it very lightweight but also durable at the same time. This ensures that your feet will not experience fatigue over carrying the weight of the footwear while working. Furthermore, I also like the contoured footbed makes it comfy work shoe. This non slip crocs also has an enclosed toe design, plus a thick metatarsal area for additional protection. To ensure a secure fit, it features a heel strap. There is also no need to worry about kitchen spills since it is very easy to clean. 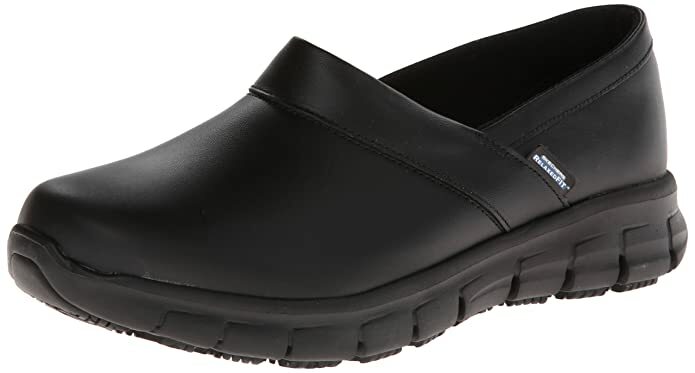 The next on my list is the Lafrost Rachel 7003 Womens Leather Slip Resistant Server Slip On Clog. For me, this is one of the most stylish non slip shoes I have ever found in the market. These service shoes feature leather uppers and rubber soles. 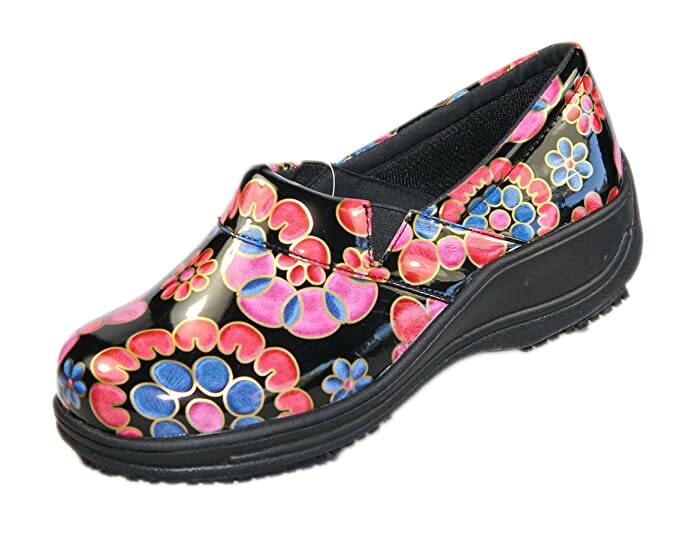 It is an easy slip on clog but with a fullback for comfort and secure fit. Another thing I like about this cool non slip shoes is that it has a memory foam insole for utmost comfort as it cushions your feet while your work. In addition to the non slip feature, the outsole is flexible and has added traction as well. The Lafrost Rachel work shoes offer great style, comfort, and protection. The shoes are unique and beautiful! Dansko Women’s Professional Mule is also one of the good shoes for waitressing or maybe one of the best. Made from leather to guarantee durability, it also features a polyurethane sole. The heel measures around 2 inches, while the platform is approximately 0.7 inches. This non slip work shoes also has polyurethane outsole with rocker bottom for the added grip. Another feature I like about it is the wide heel strike which adds stability. The Dansko kitchen shoes also have a padded instep collar. Best of all, it features a memory foam footbed that will definitely cushion and support your feet. This goes to show that it is not just your average non slip shoes after all. Last but definitely not the least is another restaurant work shoes from Sketchers. 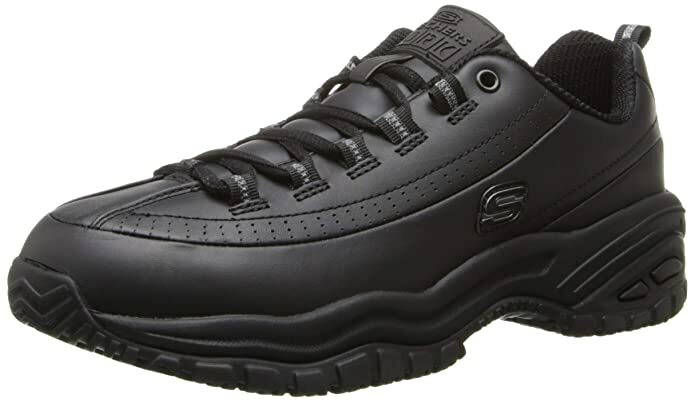 The Sketchers Women’s Relaxed Fit Slip Resistant Work Shoe features a smooth leather upper, collar overlay, and side stitching to ensure durability. To ensure comfort, it has a soft fabric lining, heel collar trim, and a padded instep. Not only that, but this particular server shoes also has a removable insole that is topped with memory foam, which is something I am personally all for. When it comes to safety and protection, it has an OSHA compliant slip resistant nitrile rubber outsole. ​Additionally, it is also safe design rated for Electrical Hazards. This Skechers non slip work shoes is outsole tested and meet the .5 coefficient rate even on wet and oily surfaces. To add to that, it also met the standards for impact and compression. When choosing the best shoes for kitchen work, there are qualities that you need to look into. These qualities can serve as a guide for you to have a better idea of which will be the best for you to purchase. One of the most important qualities of the best restaurant shoes is being comfortable. Being a waitress, I have often experienced fatigue and aches during and after work. Standing and walking all day will eventually take a toll on your feet and that often happens if you are in the restaurant setting. However, the solution is finding the footwear that will help lessen the aches and fatigue. Comfortable work shoes can do that for you. I find that a well-cushioned footwear does wonders. They absorb all the impact and pressure while standing or walking allowing the feet to be comfortable all day long. To ensure comfort for your feet, it is best to determine the proper fit before purchasing. Make sure to know your foot type whether you have wide or narrow feet and analyze the sizing chart properly. ​Restaurant work shoes need to also be durable. They should be able to stand the test of time as well as the numerous exposure to the demands of restaurant work. Like myself, many prefer leather since it is a very durable material. However, I also think that rubber and synthetic materials are not bad and can also be up for the challenge. Having an excellent grip may be one of the most important qualities of the best shoes for kitchen work. Working at a restaurant exposes you to walk on surfaces that can have spilled liquid. For safety and overall protection, non slip restaurant shoes that have an excellent grip are a necessity. This is something that I always look for when picking out footwear back when I was in the restaurant industry. Ultimately, in choosing the best work boots among the incredible list I have provided, I would strongly recommend the Wolverine Men’s Raider Boot. This cool work boot had the best features that met both comfort and protection that best fits an extreme and hazardous working environment. The removable, full-cushion Multishox insole makes it the most comfortable work boots while walking or standing on concrete. With that and also its slip-resistant, Multishox lugged rubber outsole makes the Wolverine Men’s Raider Boot the best work boots for concrete. Did you like this post? Did you have any other questions in mind? Did you find this article helpful in narrowing down the best work boot for concrete in the market? If you have anything to add or share, please feel free to sound them off in the comment section below.